Krispy Kreme glazed doughnuts set the bar high. They are light with a sticky sweet glazing. Pure indulgence. With this copycat recipe you can finally enjoy original glazed Krispy Kreme doughnuts any time you like. Warm the milk up in the microwave for around 50-60 seconds. Stir in the yeast and leave the mixture to sit for around 5 minutes. Add in the eggs, butter, salt and sugar and 2 cups of the flour. Beat together for a couple of minutes until fully mixed, occasionally scraping the sides of the bowl. After a couple of minutes stir in the remaining flour, 1 cup at a time until you have a smooth consistency. Cover the bowl and leave to one side for around an hour, letting the dough double in size. Lightly flour a surface, and empty the dough out. With a rolling pin roll the mixture until it is around 1/2 inch thick. Using a doughnut cutter, cut out the doughnuts. Top tip! Add a little flour to the doughnut cutter to stop it from pulling the mixture. With the excess mixture, roll it together and rinse and repeat the above steps. Place the cutout doughnuts onto baking paper, leaving enough room between each one. Cover all doughnuts and leave for another 40 minutes. They should roughly double in size once again. Heat up vegetable oil in a deep fryer to 360°F/195°C. Carefully slide the doughnuts into the oil once it is up to temperature, a couple at a time. Top Tip! Wet a wide spatula and use this to transfer the doughnuts. This should help avoid them becoming stretched when transferring from the paper to the fryer! Leave the doughnuts cooking for around 50 seconds, or until the bottom is golden brown, then flip them over for another 50 seconds. When both sides are golden brown remove the doughnuts with the spatula, ensuring your don’t rip or pierce the doughnut. Place them on a rack to cool. Mix together sugar, milk and salt in a bowl until you get a smooth consistency. If the mixture becomes too thick add in a small amount of milk and continue to stir. Continue this method until you get the consistency to your preference. Underneath the rack of doughnuts add some baking paper, to catch any spillage. 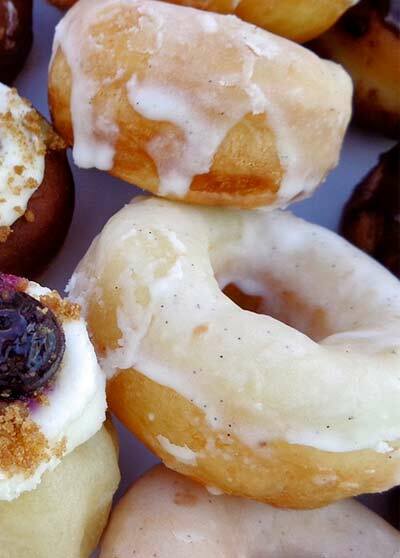 Dip each doughnut into your glaze ensuring you get good coverage on both sides. Set the doughnuts back onto the rack and allow the glaze to set.